If you haven’t visited a farm on the Canadian prairie lately, the scale of 21st-century agriculture can seem staggering. Take Trevor Scherman’s spread: 4,400 acres south of Battleford in central Saskatchewan. That’s more than four times the area of Vancouver’s Stanley Park, so if he needs to stop his tractor and wait for a hired hand to bring him more seed, it can take a while. Farmers Edge gathers data from three weather stations right on Scherman’s property and five others on neighbouring farms, and crunches the numbers to let him know if there’s a wind headed his way that might disrupt pesticide spraying. The app contains a gridded map of his farm, combining precise information drawn from satellite imagery with soil samples taken from each square on the grid. 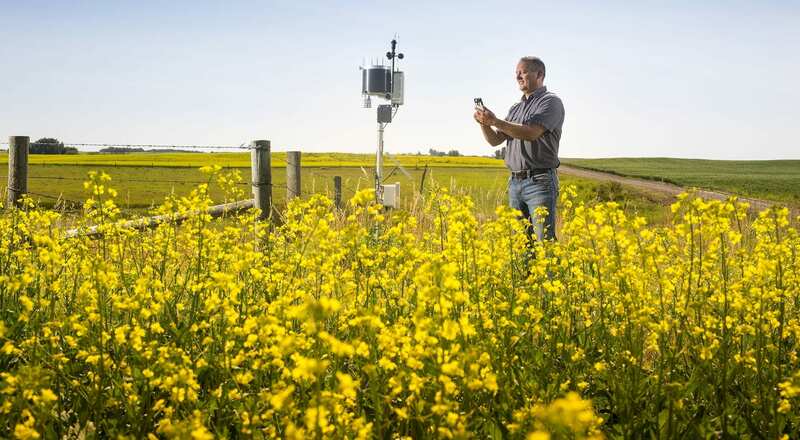 All this information is fed into a predictive model built on data gathered from the 50 million acres worked by Farmers Edge clients across western Canada. It then tells Scherman’s self-steering tractor how much seed and fertilizer is needed, grid square by grid square. The app also schedules his hired hands and tracks his finances. Farmers Edge has replaced multiple weather apps on Scherman’s phone and any number of websites, spreadsheets and downloaded files on his computer back at the farmhouse. In the seven years Scherman has been the company’s client, he has watched inputs drop and yields climb. He now spends the same amount of money to produce more — and saves time and many headaches along the way. This is what Big Data looks like down on the farm — and it’s spreading fast across the entire cultivated world. Farmers Edge, founded by a pair of Manitoba agronomists in 2005 and based in Winnipeg, is growing at Silicon Valley speed — and with some of its money. The legendary Silicon Valley venture-capital firm Kleiner Perkins Caufield Byers was an early investor back in 2014, later joined by a Japanese commodity trading firm in a $58-million financing round. They were bought out late last year by Canadian investment giant Fairfax Financial (a major investor in BlackBerry), signalling a pivot from startup to going concern. Two years ago, the company’s app and data — crunching tools were in use on 600,000 acres of farmland. Today, the number is six million, with substantial market penetration in western Canada — nearly one-tenth of all land in cultivation on the prairie is now managed by Farmers Edge clients — and new growth in Australia, Brazil and eastern Europe. Contrary to stereotype, farmers are open to change when they encounter the right kind of technology — after all, their GPS-guided tractors made them very early customers for autonomous transport. In commercial orchards, highly lucrative tree crops such as cherries and almonds have long relied on regular physical inspection to alert growers to insects, disease and other threats. 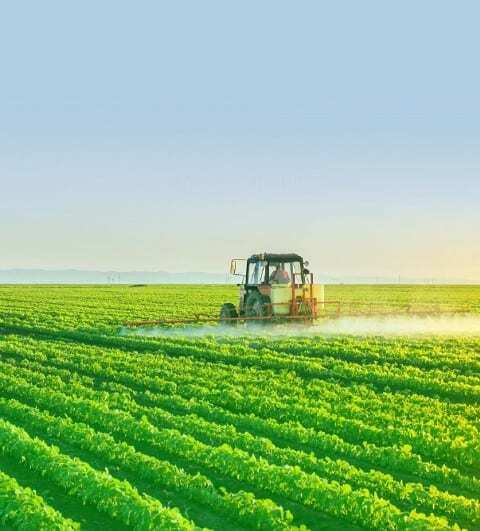 A class of bio-pesticides called “pheromones” has long been known to be very effective, but needs to be applied repeatedly each day to be effective. 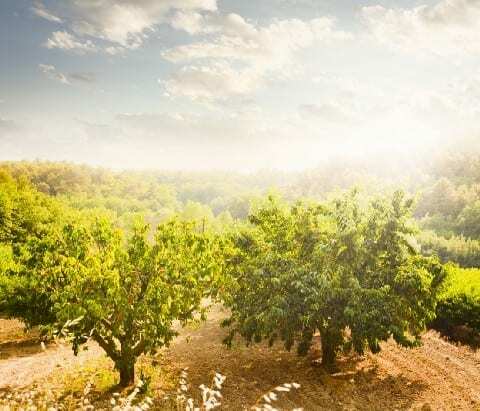 What’s more, wireless communications can’t be used to trigger the application devices because the high volume of water in fruit trees’ leaves soaks up the signals. To solve this problem, Semios developed its own sensors and wireless network, which it then paired with its pheromone-delivery system. Knowing its customers don’t want a pile of new electronic gear to maintain, the company packages it all as a subscription service. Frontier hopes to boost tolerance to drought, pests and other stresses by selectively breeding plants to be high in the protein, but without genetically modifying them. Its first field trial — a variety of durum wheat the company hopes could increase yields by up to 20 per cent in drought conditions — began in the United States this spring. If it’s successful, the new wheat could be planted commercially in western Canada within five years. Frontier also intends to use a “pay as you grow” model — a sort of royalty based on annual yields. This approach is a rebuke to the global agribusiness model often employed by conglomerates such as Monsanto. They sell seeds that don’t reproduce, meaning farmers can’t save some of their harvest for the next planting. “I don’t know if I ethically agree with that,” Northey says. The future of commercial-scale farming can seem daunting — larger and larger farms run by fewer and fewer people, a world in which reams of data feed autonomous machines that gather yet more data to figure out solutions as they operate. 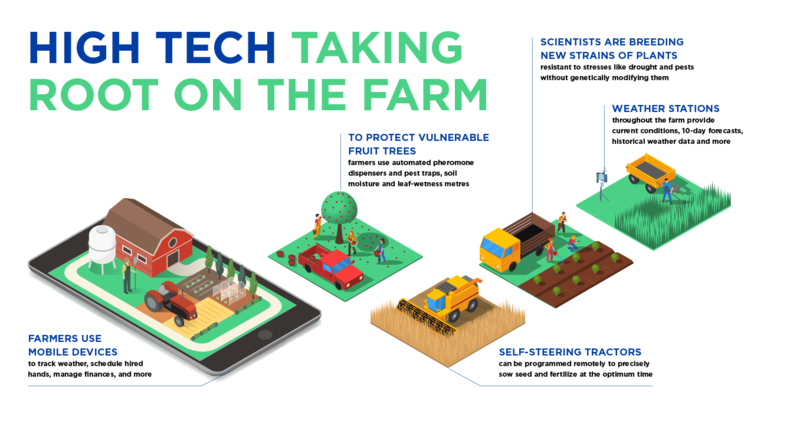 “Farmers now need to consider carefully who they’re partnering with to protect and back up their data — their business depends on it,” says Tanya Rosemarin, a vice president at Chubb Insurance, a global leader in technology insurance. 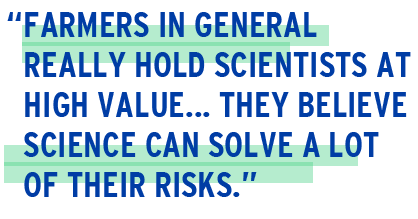 But to the industry’s pioneers, this “machine learning” looks like the dawn of a bright future, where less money and seed are wasted, fewer chemicals are needed, and high-priced expertise can be applied where it’s most valuable. Consider how Farmers Edge has begun to use its staff agronomists — those old-school experts who gather and analyze soil samples and figure out what farmers need to do to boost their yields. The data collected to feed the company’s soil-nutrient modelling has reduced the need for gathering soil samples from every eld each year. This allows the company to focus its human expertise on new clients and new markets where it has less data on hand. Back in the fields, where is all this automation and data crunching going to lead? “I think remote- control farming is coming,” says Bruce Ringrose of Farmers Edge.